We really love our Haba Toys. They are safe, fun, and out of the ordinary. The brainchild from Germany creates the most delightful and engaging toys for infants and children. I can tell we are going to have a long love affair with Haba. After our resounding success with the Haba Stroller Chain; we decided to purchase another Haba Toy. We bought this little delightful Haba Baby Bear Ankle and Wrist Rattler. It attaches like a bracelet so you won’t lose it and it won’t fall to the dirty ground. The rattle makes a pleasant noise, and not jarring; the problem I had with toys nowadays. 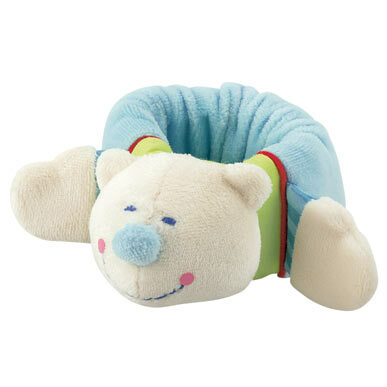 It’s plush which is great for teething. The smiling bear seems to incite a smile even from the fussiest baby. We love rattling it ourselves when our little one won’t settle down. It seems to work, because she stops fussing and starts laughing. Although it’s a Haba Toy, it is made in China. However, weary parents be assured; the standards for European toys are a lot higher than the U.S. when it comes to passing safety inspection. We really love this one and feel confident other parents will love it too. The socially responsible toy company, Haba, is a good bet for even the most discerning and environmentally minded parents.